Donate us your aluminum cans ! 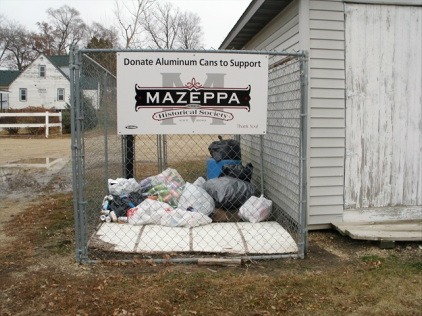 The Mazeppa Area Historical Society is now accepting your aluminum can donations ! The drop off cage is located behind the Mazeppa Community Center where aluminum cans, can be dropped off for Donation at your convenience, anytime ! Thank You to all for supporting us ! The "Adopt a Highway" program. 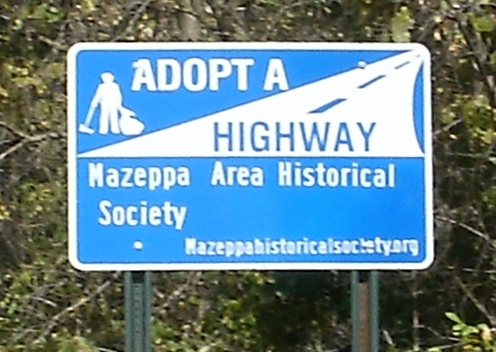 The Mazeppa Area Historical Society has joined The "Adopt a Highway" program ! On Saturday morning 10/29 a group of 5 members started their 1st Road ditch clean up. The MAHS is responsible for a two mile stretch of County Road 1, north of town from the start of cemetery hill to Trout Brook.